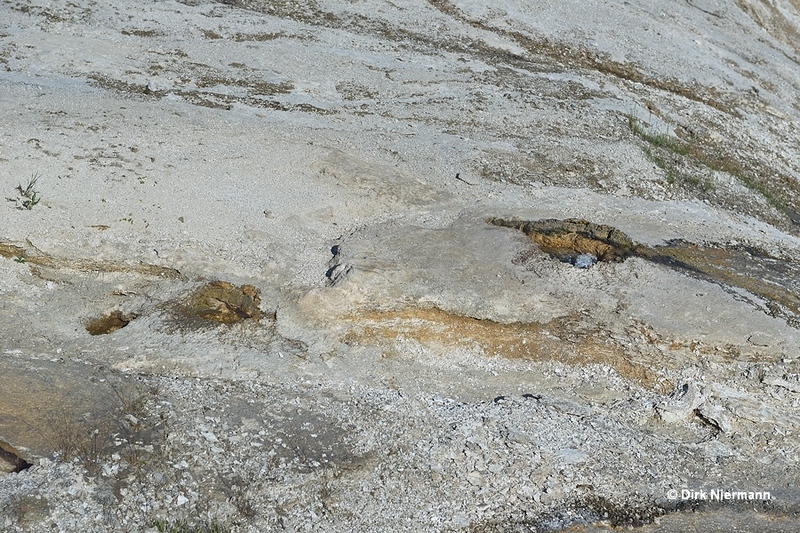 A few feet northwest of Oval Spring a tiny vent appears on the plain surface next to the walkway. 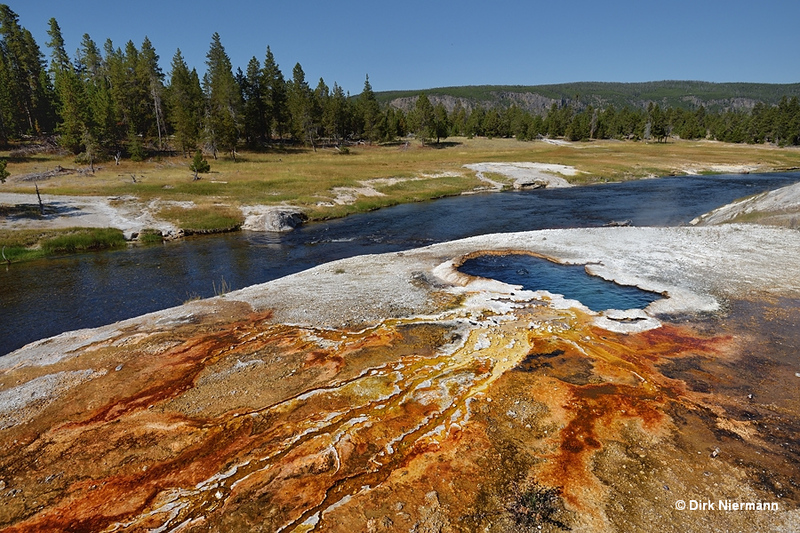 It belongs to a very small, irregularly active geyser, informally named "Nifty Geyser". 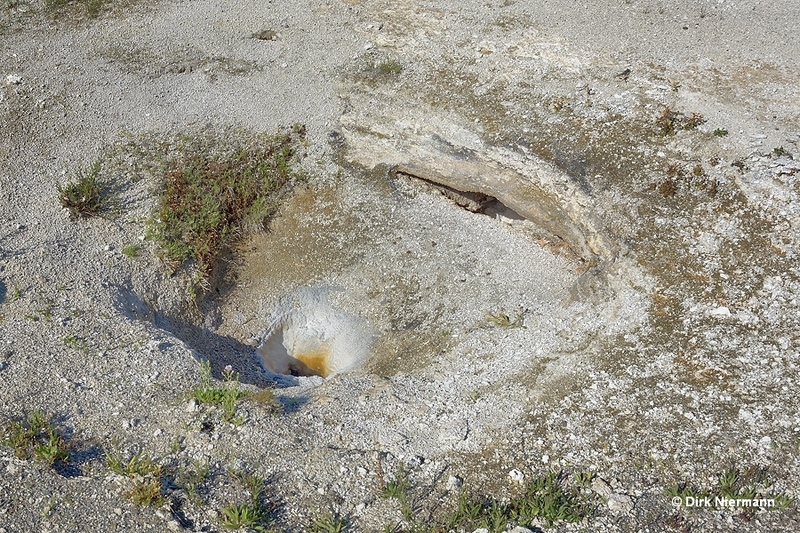 In close vicinity Old Tardy Geyser, another member of the Sawmill Complex, is to be found. 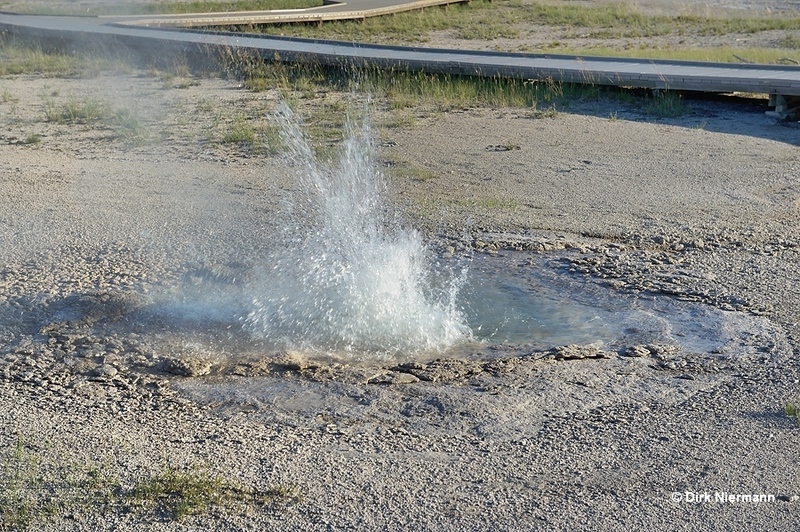 The crater resembles very much Tardy Geyser, and perhaps this is the reason for the name. Usually Old Tardy Geyser is only active when the group is in "Sawmill mode". 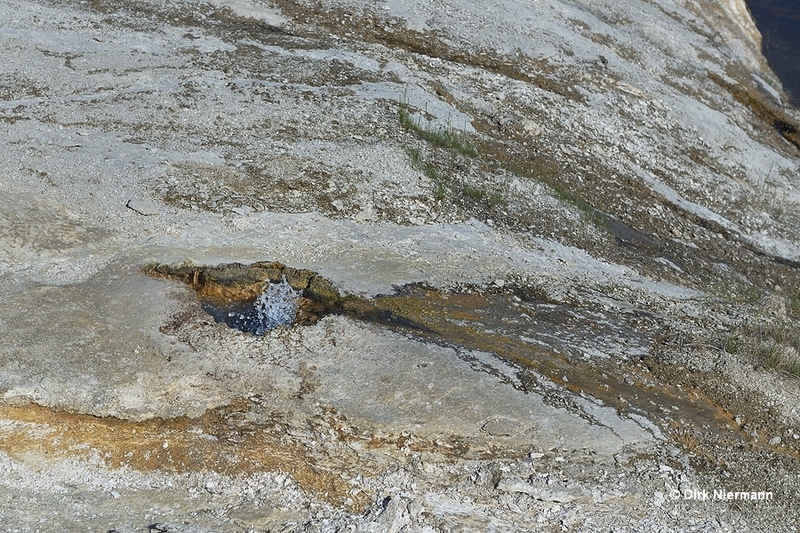 Next to Old Tardy Geyser you may notice a seemingly dry crater directly in front of the boardwalk. USmGNN006 looks as if it had been a quite active spring in the past. Nowadays at least the water level is visible deep down in the vent. 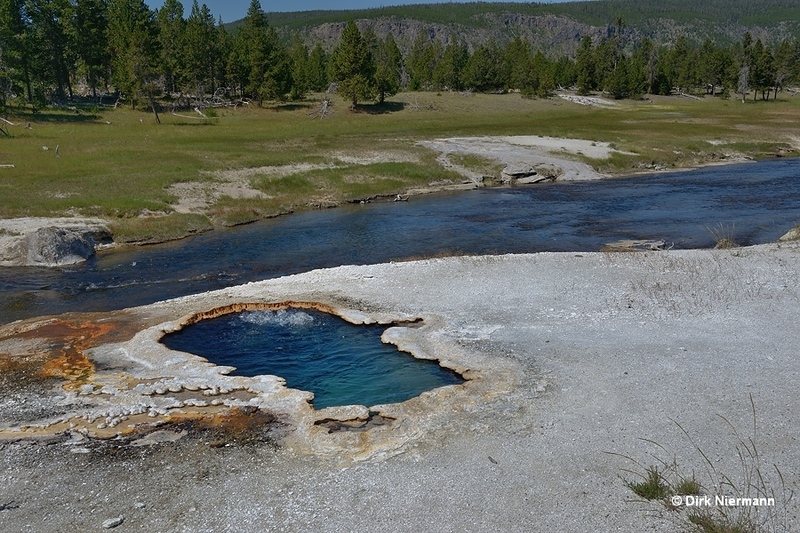 The intermittent Crystal Spring northwest of Old Tardy Geyser is already a member of the Grand Group, as well as Belgian Pool and Bulger Spring across the boardwalk. 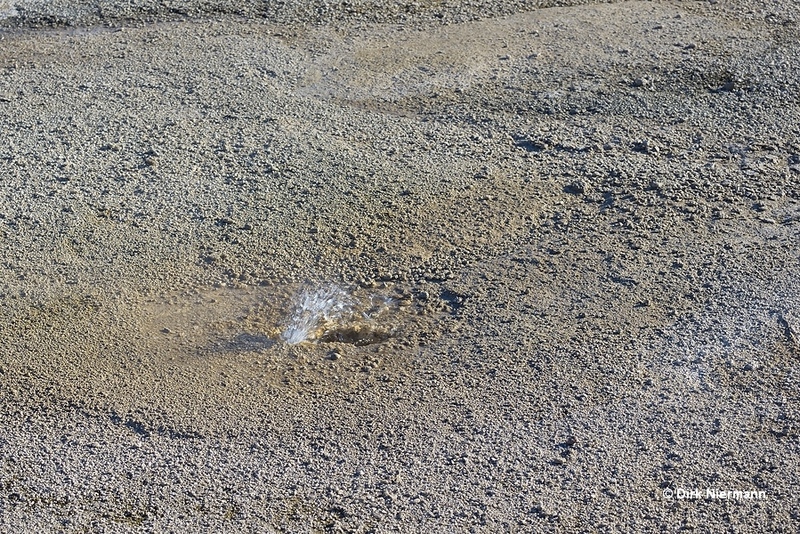 But between Crystal Spring and Old Tardy Geyser, more precisely in the runoff of Crystal Spring, Slurp Geyser is hidden. This member of the Sawmill Complex shows weak splashes on rare occasions. Past Belgian Pool on the right hand side the trail forks to Grand Geyser, on the left hand side it leads back to Sawmill Geyser. Choosing the latter option, you soon reach the branch-off to Castle Geyser. Along the way down to Firehole River additional members of the Sawmill Group can be observed, such as Churn Geyser across the boardwalk from Sawmill. In "Penta-Churn mode" it may play up to 4 m (13 feet) high. 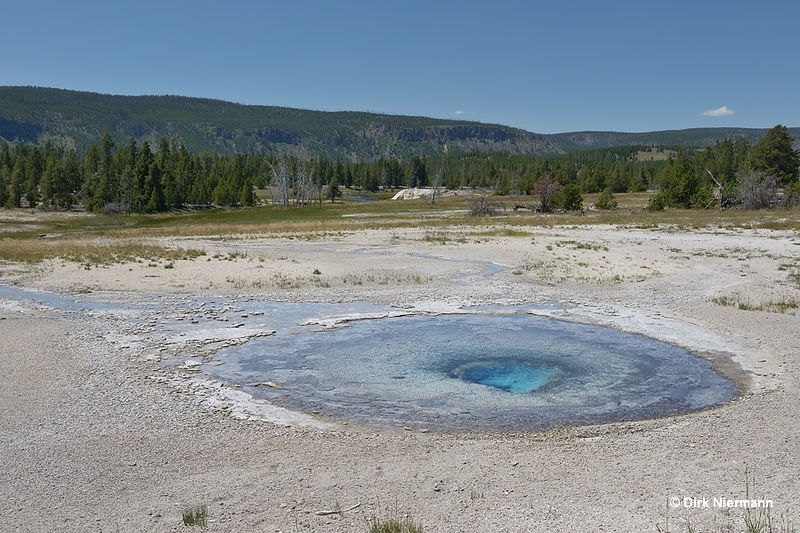 Before the boardwalk from Sawmill Geyser to Firehole River has been rerouted in June 2013 due to a shift of thermal activity, it passed next to Scalloped Spring, which allowed to look directly into the bowl. Currently the boiling, otherwise quiet feature can still be seen, but from a larger distance. 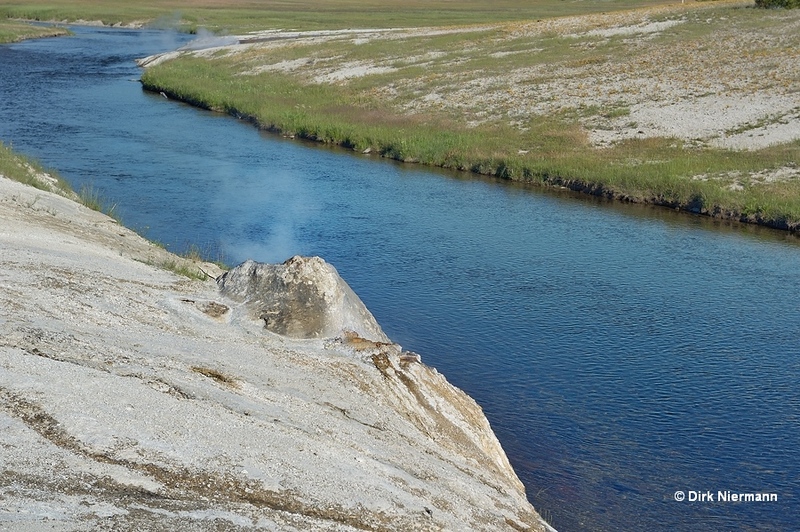 Downslope the slightly splashing South Scalloped Spring occupies the bank of Firehole River. In 2017 this spring showed an exceptionally splendid runoff. 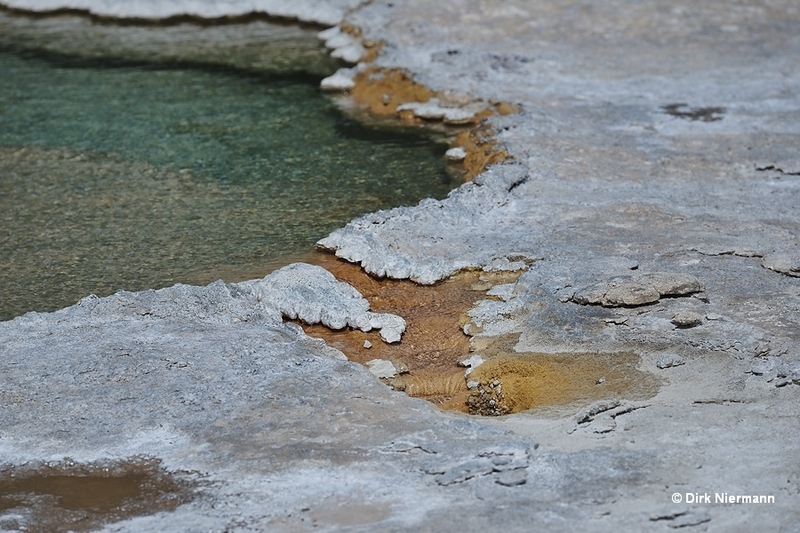 Beyond South Scalloped Spring Deleted Teakettle Geyser can be spotted. Obviously, the deletion of its name from the geyser lists because of too many features named "Teakettle" has been done not rigorously enough. 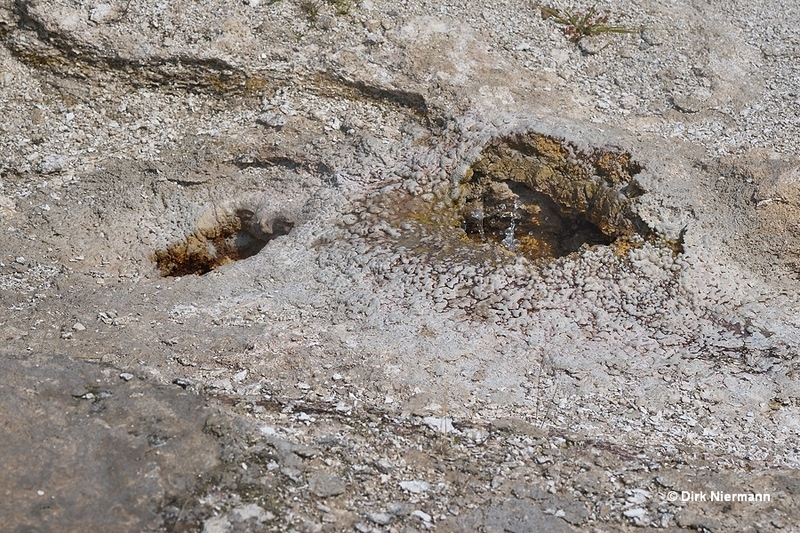 It seems Deleted Teakettle Geyser didn't take the attempt amiss and continues splashing up to 50 cm (1 or 2 foot) high every few minutes. Across the boardwalk form South Scalloped Spring some very small vents require a closer look. 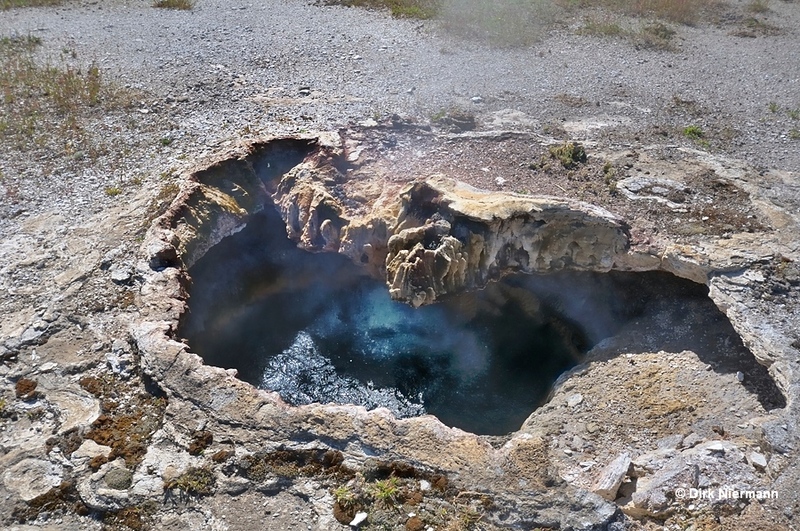 The pair of openings on the left hand side belong to the rarely active Snake Eyes Geyser. A curved step on the sinter adumbrates the snake's body. Its neighbor to the right is another small geyser, informally called "The Rattler", representing the end of the snake's tail. A few feet upstream Chimney Cone sits next to the river. 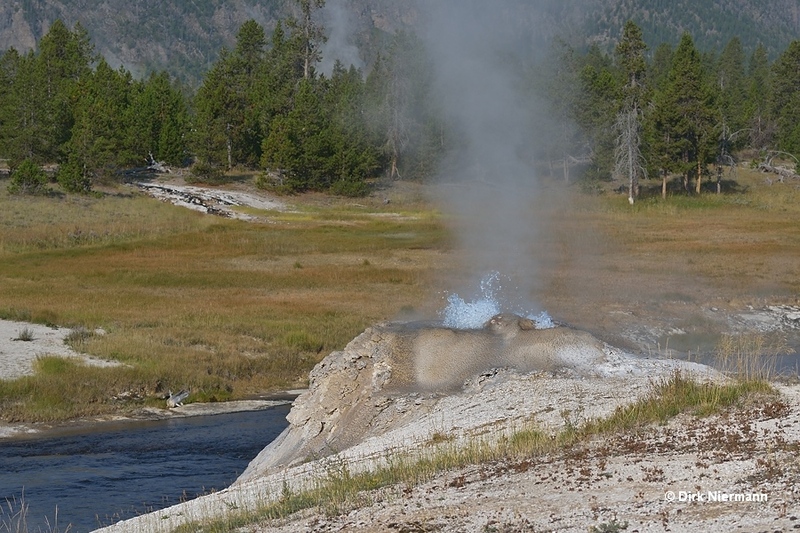 Its no geyser, just as little as the small Chimney Cone Spouter at its base.